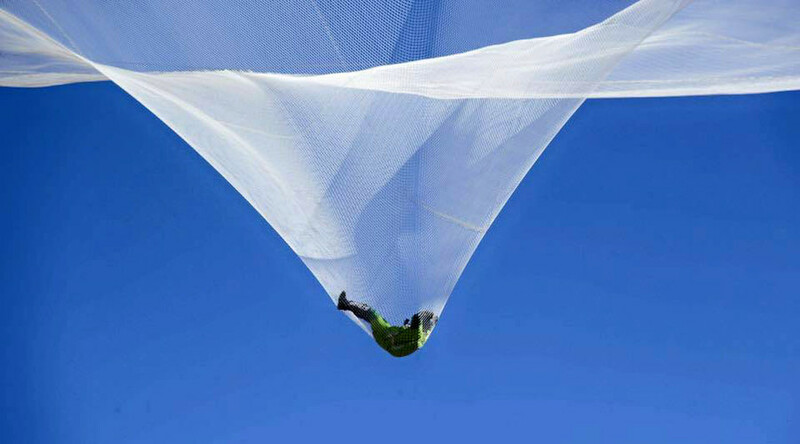 Millions of people across the globe held their breath as American skydiver Luke Aikins jumped out of a plane to fall into a net 25,000 feet (7,620 m) below. The daring stunt is now in the history books as the first complete jump without a parachute. Aikins, 42, performed the record-breaking jump in Simi Valley, California on Saturday evening. #lukeaikins completes record-breaking #heavensent jump! He successfully landed in the 100-by-100 foot (30.5-meter) net, which was set up 20 stories high, as people watched from the ground and cheered. After just a few moments, Aikins rolled out, got up, picked up his wife, and gave her a celebratory hug. The project took 18 months to prepare for. “If I wasn’t nervous, I would be stupid,” Aikins said before the stunt. The jump began about 25,000 feet (7.6 km) off the ground and required an oxygen mask, which was removed by one of the people on his jumping team at 18,000 feet (5,486 m). Towards the end of the jump, Aikins flipped onto his back and plummeted into the net at 150 miles per hour (241 km/h). Curiously, as Aikins was entering the plane, the Screen Actors Guild said he was required to wear a parachute. However, the requirement was lifted shortly afterwards, as Aikins argued it would be more dangerous to perform the jump with a chute on his back. The idea of pulling off the death-defying stunt was not actually Aikins’, but that of his friend, Chris Talley, who proposed it about two years ago. Aikins refused at first, saying he had a wife and a son to think about, but eventually reconsidered. His jump was broadcast on TV with a delay – and a warning for viewers not to try this at home. Even before the Saturday thrill, Aikins had an impressive skydiving record, with 18,000 parachute jumps under his belt. He made his first skydive at the age of 12, and was jumping solo by age 16. He has also trained a number of top skydivers and worked as a stuntman on movies like Ironman 3.